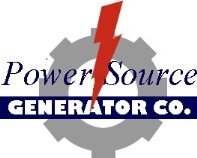 Power Source Generator Co. Is a full-service power generator company. We offer a full line of both portable and installed generators to meet the needs of homeowners and businesses alike. We take great pride in providing quality products that we are proud of, and we will only endorse those products that we believe will serve you well into the future and be good value for your invested dollars. We strongly believe that, "The only products or services that succeed are those that provide a benefit to the consumer that is greater than their cost." Our facility not only provides great products. We have the expertise to repair all products we sell, quickly and efficiently. We work hard to keep YOU "out of the dark." When it comes to alternate power we are committed to be the best because that&apos;s what our customers not only want but need. We don't just sell generators - we sell systems. That means that when you deal with us you'll get ongoing service after the sale. And when you need us for advice, repairs, upgrades or a super planned maintenance program, we&apos; ll provide it with confidence and dedication. We are never farther away than a phone call or an email. We've got the Power. We'll get it to you. Copyright © 2014, Power Source Generator Co. All rights reserved.